What's bright pink with white grout and daisies all over? Aren't they sweet? I love that they are personalized. P.S. Join me on Facebook! Join Marymaking Designs on Facebook! Did you know you can find Marymaking Designs on Facebook? Click here to check out the Fan Page. Tell your friends, family, cats, dogs, neighbors, etc. too. See you there! I've wanted to share cross ornaments with a few of our close friends for a long time, and right before Christmas (nothing like waiting 'till the last minute! ), a bag of sparkly tiles caught my eye in my studio. The tiles were an "extra", tucked into an order from a mosaic supplier. I quickly sat them aside, thinking I would never us them. I'm so glad I picked them up and played around with them because I also had the perfect cross ornaments bases to set the tiles in. I love it when things unintentionally fall into place! So fun! Ooooooooooh . . . sparkles. The crosses were all very well received, but I think our friends are probably a little biased. ;) I'd love to hear what *you* think. Like 'em? Love 'em? Think they're gawdy? Tell me what you think in the comments. Thanks! Size: Medium Cross Base; 9" x 13"
Materials: Transparent art glass, True blue stained glass, Sapphire crystal beads, Flat glass beads in various colors, White and blue grout, Wood base painted with blue metallic and copper paint. This beautiful cross has been a long time in the making. Molly's mom, a former client, contacted me several months ago about making a special cross for Molly's First Communion. Two years ago, I made a First Communion cross for Molly's sister, Grace (click here to see Grace's cross), so I was thrilled to have the opportunity to create another special cross for their family. My client wanted the design to be bright and fun. She also wanted the cross to be similar to - but not matching - Grace's and have stars in the background. I think we accomplished that! I found some awesome flat beads, and the design came together quickly. I painted the base of the cross metallic blue and scattered hand-painted copper stars throughout the background. I used clear glass so the stars would show through the glass. I have such a love / hate relationship with clear glass. I love that it gives me flexibility: I can paint the base of the cross and whatever I paint shows through. Amazing possibilities. (Two other examples of this technique are my Everlasting Covenant (see it here) and Calm My Anxious Heart (see it here) crosses.) But clear glass also requires absolute perfection in cutting. Glass tends to fracture when not cut perfectly. These fractures are hidden in the glass in non-transparent glass but, with clear glass, any fractures in the glass are obvious when placed on the base. Therefore, my cuts have to be exact; using my nippers to help "fudge" a cut is not an option. The good news is that results are always more than worth it. 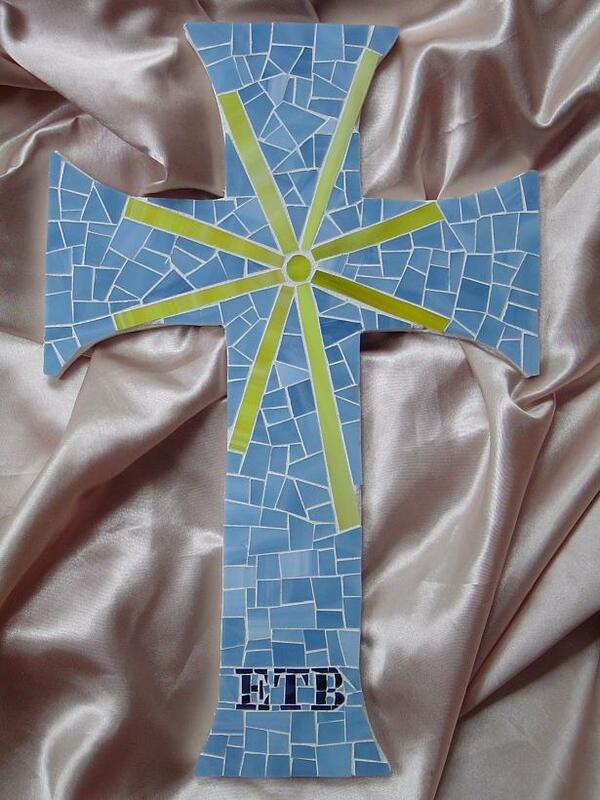 To my client, thanks for giving the opportunity to create this mosaic cross for Molly, and thanks for your patience. I wish Molly so much happiness and joy! Join my Facebook Fan page here. So . . . it's been almost 6 months since I last posted. 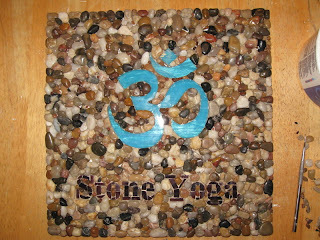 Let's just say that the Stone Yoga plaque (see post below) sucked my will to mosaic on many levels. After finishing the plaque, I threw my cutters, nippers and Weldbond into the studio and didn't touch them until this past weekend. In the meantime, I've been busy playing lawyer and being the Mom Taxi. I'm blessed that way. Anyway ~ about my latest mosaics. I made my first Junior League ornament in 2003. Since then, my client has ordered JL ornaments several times. She told me today that she gives them to officers of the organization, and the 2008 batch will go to the executive officers. I incorporated the Junior League logo into the ornaments' design and handcut each piece of glass. Yep, even those teeny tiny, vertical pieces. I have the gash on my finger to prove it. I am so glad I picked up my glass cutters and started mosaicing again. Guess what I learned? I really enjoy mosaicing (well ~ maybe not the slicing my finger with a piece of glass part of mosaicing). Go figure. I'm looking forward to finishing a few other long-standing orders over the next few weeks. If I'm still working on something for you, get ready: your lucky day just might be drawing nigh. Ha! Be sure to check back. I'll try to post a little more often. I'll be back to share more about my latest piece of artwork . . . but here's the pic.